(Nanowerk News) A simple method for making a family of potential battery electrolytes has been developed by RIKEN researchers, using ubiquitous carbon dioxide as one of the key chemical ingredients (Angewandte Chemie International Edition, "Synthesis of lithium boracarbonate ion pairs by copper-catalyzed multi-component coupling of carbon dioxide, diboron, and aldehydes"). 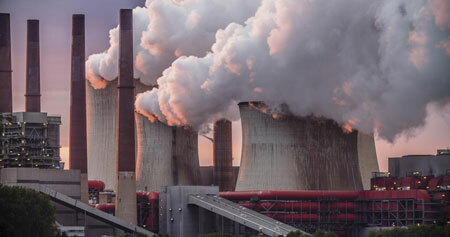 Coal-powered power stations, such as the one shown here, as well as many other industrial plants generate carbon dioxide. RIKEN researchers are trying to go in the opposite direction—using carbon dioxide as a raw material to make better electrolytes for lithium-ion batteries. Electrolytes carry charged ions between the two electrodes of a battery and are usually dissolved in solvents such as carbonates. Because they are stable, environmentally benign and good at transporting lithium ions, lithium borate salts are being studied as next-generation electrolytes for rechargeable lithium-ion batteries. But chemists lack efficient methods for producing these salts, making it difficult to optimize them for use in batteries. Zhaomin Hou of the RIKEN Center for Sustainable Resource Science and colleagues have now developed a simple method that uses carbon dioxide to produce a wide range of lithium boracarbonates, which combine some of the chemical properties of both lithium borate salts and carbonate solvents. “Their unique structure and composition could make these compounds useful as electrolytes in lithium-ion batteries,” says Hou. Researchers around the world are searching for ways to use carbon dioxide, which is one of the key drivers of human-driven climate change. In principle, the gas could be used as a low-cost chemical feedstock, but this application is limited because of carbon dioxide’s low reactivity. Hou’s team discovered that a particular copper-containing catalyst spurred the reaction between carbon dioxide, a common reagent called bis(pinacolato)diboron, and a series of different organic molecules known as aldehydes. “We were surprised that the multicomponent coupling reaction took place in such a remarkably selective and efficient fashion,” says Hou. Supplying carbon dioxide at five times atmospheric pressure, they ran the reaction with a series of 18 aldehydes and produced lithium boracarbonates with yields between 53 and 91 per cent. They used x-ray crystallography to confirm the structure of one of these products. They also suggested a reaction mechanism that explains how the copper catalyst helps to activate the reagents so that they combine with carbon dioxide. “These findings will help us design new reactions with various substrates,” says Hou. The team now plans to investigate the electrochemical properties of lithium boracarbonate compounds and test them as electrolytes in rechargeable lithium-ion batteries. “We will also continue to investigate the efficient and selective synthesis of novel, useful chemicals using carbon dioxide as a feedstock,” adds Hou.